Saws : Welcome to the VintageSaws.com Online Store! What is vintage? With respect to the saws that we have for sale, vintage means that no saw we offer is younger than 50+ years. 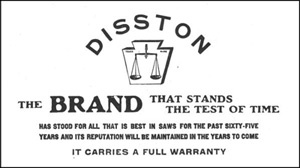 Most of our saws are Disston's, partly because they were the biggest saw maker in the United States and there are more of them, and partly because we have a special fondness for Disston products here at Vintage Saws. Henry Disston made his first saw in 1840. The company continued on for the next 115 years, changing names several times as he took on his Sons as partners. Finally, in 1955, the company was acquired and so began the long inevitable spiral into oblivion. At Vintage Saws we seek out any high quality saw by any maker and offer it for sale. There are many Disston saws available. In addition, there are also saws offered by Atkins, Simonds, Richardson, Peace and many others. All have a few common characteristics which make them desirable. First and foremost is a good quality blade made of high carbon steel. The saws we carry were made before the day of plastic handles and impulse hardened teeth. The teeth were meant to be sharpened and set to allow for a smooth cutting blade. All our saws, unless otherwise noted, have taper ground blades. Taper grind refers to the way a saw blade is ground to allow an edge of constant thickness, while at the same time becoming thinner as you approach the back of the saw. This feature was only used on hand saws. Back saws have blades of constant thickness. Since the blade becomes thinner as you approach the back, the blade creates its own clearance as you cut, drastically reducing the amount of set required. The less set, the less wood is removed in the cut making the saw easier to push. Only the very oldest and newest saws have blades of constant thickness throughout. Saws with this type of blade are hard to push and tiring since they are much heavier and should be avoided. Unfortunately, the same qualities that make high carbon steel so good for saws also makes them susceptible to rust. 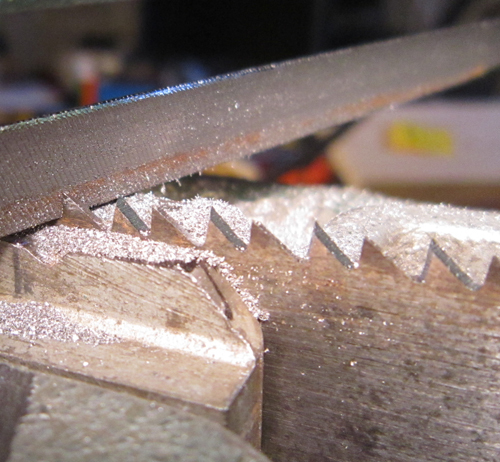 Unlike almost any other tool, saws are almost rust magnets. It is becoming increasingly hard to find vintage saws with pristine blades. All the saws that we offer, however, have blades that are rust free and ready to work. Many vintage saws, when found, have at least some surface rust. Surface rust, when caught in time is easily removed and causes no harm. If left alone, however, surface rust over time eats into the plate of the saw blade, causing pits. In and of themselves, pitting does not harm the blade. However, when pits occur in the area of the teeth, the teeth can never be sharpened to take a keen edge. Rip saws are the exception to that rule. Since the teeth are filed straight across, the entire width of the tooth does the cutting, not just the outside edge as in crosscut saws. Unless the pits are very deep, rip saws with mild pitting can still be sharpened to give excellent results. A properly sharpened blade is the next most important part of the saw equation. Since virtually no one uses hand saws in day to day work anymore, finding competent people to file and set saws is becoming very difficult indeed. Many commercial filing shops don't know how to file saw blades or even the basics of saw tooth geometry. Here at Vintage Saws we take the guess work and trouble out of finding someone to sharpen your new vintage saw by doing it ourselves right here in our own shop. We've literally filed thousands of hand and back saws using only the highest quality files and machinery. Once filed and set, each saw we sell is test cut in hard wood to ensure that it cuts as intended before we ship it out. Try to find that level of service at your local sharpening shop! We take great pains to ensure that when your saw arrives, it will cut right out of the box. No guess work, no trying to find the right size file. The next most important thing on a quality hand saw is a comfortable handle. It is remarkable what a joy a hand saw is to use that is fitted with a properly shaped handle. Ask anyone who has used a vintage saw what makes them so special, and at the top of the list is the handle. They fit the hand like a glove and provide for hours of comfortable cutting without raising a blister. Handles on saws take a lot of abuse. Often, when a saw is dropped, the first thing that hits the floor is the handle. This often cracks the handle, or at least causes some chips to be missing from one of the "horns" that are present on the hand saw. Most of our hand saws have handles with little or no damage. We avoid saws which have badly damaged handles. Most handles have some small amount of wear from contacting other tools in the tool box or through use. This wear is normal and adds to the character of your vintage saw. Avoid the temptation to refinish the handle on your saw. Unless all the finish is missing, or a large percentage of it, leave the finish alone. Remember, you are just the latest person to own the saw that you have purchased. You might be the second, third or even fifth owner. Each person who used the saw left his own marks on the handle. Some staining from where the forefinger touches the handle, a stamp with the previous owner's name or a very subtle smoothness from constant handling all could be present on your saw. To remove it is unnecessary and removes forever any historical value and charm your saw has. Most of the handles on the saws that we carry are made of apple or beech. Occasionally, on very high end saws, rosewood or mahogany was used. All these woods make excellent saw handles and add to the beauty and appeal of vintage saws. Since the vast majority of our saws were made by Disston, our saws are grouped by model number. Browse the categories shown at the left to see what is in stock. Since our store is automated and requires payment at the end of each purchase, you can be sure that if you see a saw for sale here, it is available. Once you pay it is deducted from our inventory and prepared for shipment. In general, it takes about a week to get a saw ready to ship. We sharpen each saw as it is sold and carefully box it for shipment. We hope you enjoy your purchase!